While I wasn’t able to review as many shoes as I would have liked to this calendar year, I still hooped in quite a few including the Under Armour Curry 1, adidas Rose 6, adidas CrazyLight Boost 2015, adidas Crazy 8, Brandblack Black Hawk, Nike Zoom HyperRev 2015, Nike Kyrie 2 and Jordan CP3.VIII. If you’ve read my Rose 6 review here or over on tackl, you’ll know how much of a fan I was of the Rose 6. It’s no surprise then that it’s my 2015 shoe of the year. Simply put, the Rose 6 is the best cushioned basketball shoe on the market right now – maybe the best one ever. Adidas finally nailed the Boost setup in a hoops shoe, marrying two plush units with a stable midsole for a near-perfect balance of comfort, transition and support. If it sounds like I’m gushing over the shoe, well I kinda am (and they were paid for with 130 of my own dollars). First and foremost, Boost is just ridiculously comfortable. No shoe can hold a candle to the Rose 6 in terms of step-in comfort. The forefoot unit is the key one here, as adidas had to take into account forefoot stability and court feel with such a plush, responsive cushioning material. 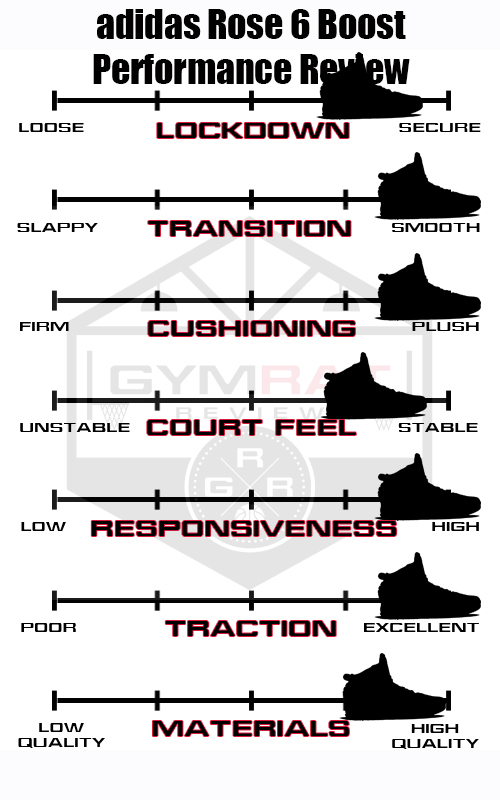 The volume of the forefoot Boost struck that balance perfectly, giving great responsiveness that we’ve come to expect from a Boost unit while also remaining stable and providing good enough court feel for a guard like me. 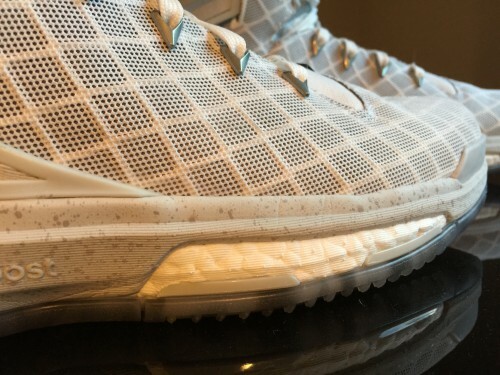 I think the Stableframe midsole is key too – as we’ve seen in the CrazyLight Boost models, Boost can be rendered way less effective and less comfortable when it’s not paired with a supportive carrier. Robbie Fuller totally nailed it. The Rose 6 knocked cushioning out of the park in every aspect I care about. 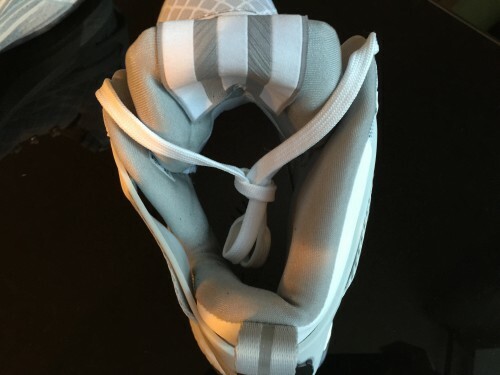 From there, they went nuts on internal padding, which is thick and comfy all over. Yeah, the tongue is a little weird but it pads the top of the foot and ankle very well, protecting them from the potentially harsh feel of that top strap. Another great design element was the fabric used on the lining, which was smooth if you felt it from the top-down, yet was grippy when felt from the bottom-up. This just meant it gave you a little extra help in the lockdown department and kept the foot in place even more. Traction was awesome in the white/silver colorway I tested, and I found the overall fit was great too. Once the upper broke in after a few minutes, it was easy to get everything laced up tightly. The white/silver upper was a bit basic, with a mesh/synthetic combo for a fuse-ish feel, but it was flexible and more than adequate in all areas. The most obvious visual element is the TPU heel cage, which really didn’t help a ton as far as lockdown, but nonetheless gave the Rose 6 a nice stable external frame. I would have loved to see it articulate a bit more for that exoskeletal feel. To be frank, the shoe is a little ugly (in the white colorway anyway, the away black/red is fire) but it played so well, I don’t really care. It functions beautifully, so it’s beautiful to me. 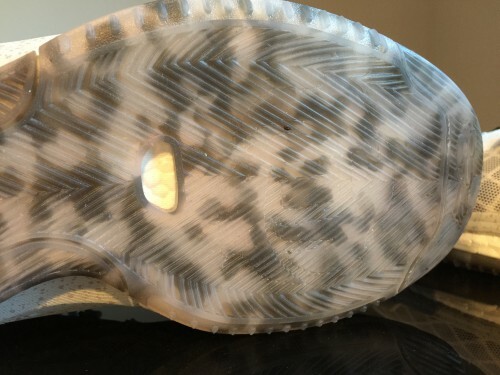 Unfortunately (and unexpectedly) I did have an issue with the outsole beginning to peel away from the Boost unit on the heel where a tiny outsole flange sticks out. 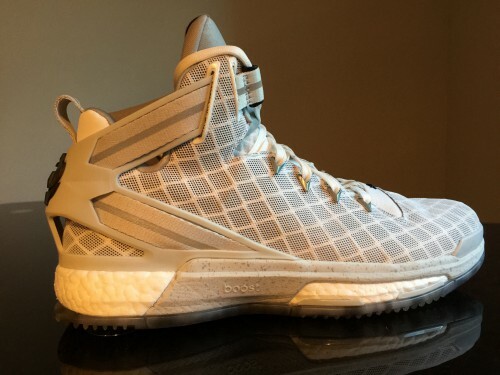 I’ll be sending the Rose 6 back to adidas for replacement, but it’s not an issue I’ve read about elsewhere. The shoe is simply so good on-court that I can overlook this for now. Doesn’t matter how it looks, doesn’t matter if Derrick Rose is a superstar anymore or not. Bottom line, if I had to wear any shoe I tested this year for a championship game, the Rose 6 would be my go-to without hesitation. Therefore, it’s The Gym Rat Review 2015 Shoe of the Year.